0to300golf: Understanding Ball Flight - Why Did the Ball Curve That Way? Understanding Ball Flight - Why Did the Ball Curve That Way? In order to understand ball flight there are three questions to ask. In the last blog post, the first question, why did the ball start there?, was answered, in this post the second question, why did the ball curve that way?, will be answered. Of the five impact factors, clubhead speed, club path, club face angle, angle of attack and centeredness of strike the main ones that affect ball curvature are club path, face angle and centeredness of strike. What causes a ball to curve is a tilt in it's Axis of Rotation. The axis of rotation is the axis in which the ball is spinning around. The ball spins around one axis, sometimes people believe there is a combination of backspin and sidespin, but this doesn't happen. The line going from left to right is the axis the ball is back spinning around. The axis is also tilted to the right in this photo meaning the ball will move from left to right in the air. Imagining an airplane turning is a good way to see how a tilt in the axis of rotation will affect the flight. 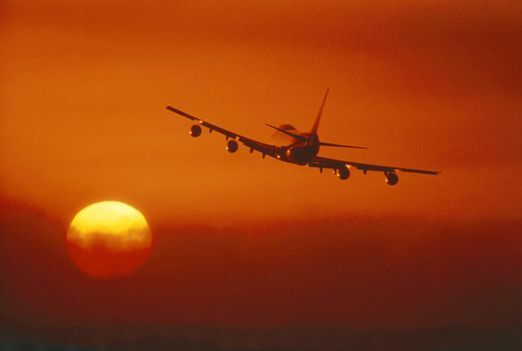 With the wings tilted to the right in this photo the plane is turning right. A ball with a tilt to the right will move from left to right and a tilt to the left will have the ball moving right to left. Trackman figures show that for every 5 degrees of tilt in the spin axis the ball will curve approximately 3.5 yards to the side for every 100 yards of carry. Spin Axis tilt is caused by a difference between club face angle and club path, Trackman names this difference as Face to Path. If the face is open to the path, the spin axis will tilt to the right and the ball will move left to right. If the face is closed to the path, the spin axis will tilt to the left and the ball will move right to left. Gear effect on clubs, mainly woods, also has a major influence on spin axis. Heel strikes tilt the spin axis to the right, resulting in left to right shots. Toe strikes tilt the spin axis the the left, resulting in right to left shots. 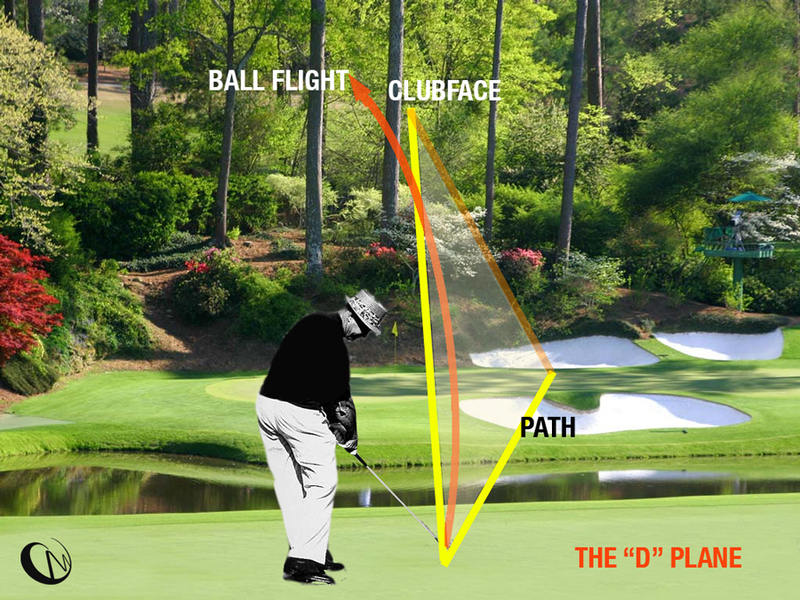 The D-Plane or Descriptive Plane was coined by Theo Jorgensen in his book 'The Physics of Golf'. The easiest way to describe D-Plane is it is the plane that contains the initial flight of a golf ball after impact with the club face. The D-Plane is created by the club path and the club face orientation at impact. This picture from www.brianmanzella.com is a good illustration of the D-Plane. The face is closed to the path, causing the spin axis to tilt to the left, the ball will move from right to left and initial starting point is closer to the clubface than the club path. Earlier on it was mentioned that the strike point on the face would affect the spin axis. This is due to Gear Effect. A golf club will rotate around it's center of gravity. A golf ball that impacts on the face in line with the center of gravity will have not have any face rotation due to the contact collision. Is the ball strikes more towards the toe the club face rotates open and vice versa for a heel strike. 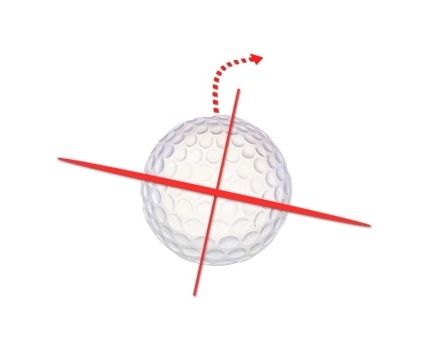 Gear effect is the counter rotation inflicted on the golf ball due to the interaction of the rotating face on the golf ball. A toe strike causes the spin axis to tilt to the left and a right to left ball flight. A heel strike causes the spin axis to tilt to the right and a left to right ball flight. For irons the center of gravity is close the the club face and irons exhibit minimal gear effect. With woods the center of gravity is quite far from the face and woods exhibit significant gear effect. For a driver Trackman indicates that an impact that is 0.5 inch from the center will impart 20 degrees of spin axis tilt. This is quite a large number and is a major factor in ball flight. It can override the influence of the D-Plane at times. Here is a photo from www.tutleman.com illustrating gear effect. One other factor that effects curvature is the rate of closure of the clubface through impact. If the face is closing around a point behind the face it will impact the spin axis like heel contact gear effect. The factors that determine curvature of the ball are the difference between the club path and club face orientation at impact. The D-Plane illustrates this. 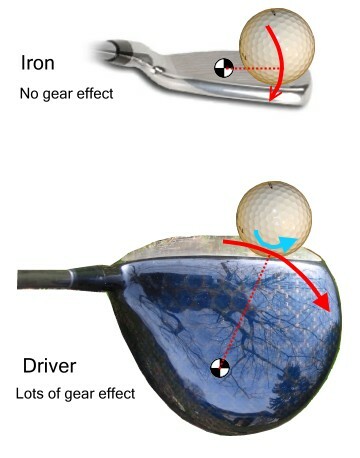 Gear effect also has a big impact on spin axis and how the ball curves. The least known factor is the face closure rate, a the face is closing around a point behind the face it will impact the spin axis like heel contact gear effect. As a result the main way to hit a straight golf shot is to have a centered strike with little face closure combined with a club path and face angle that are pointing in the same direction at impact. A straight shot can also be obtained when a non centered strike counteracts a face to path difference. Any questions and comments are always welcome.